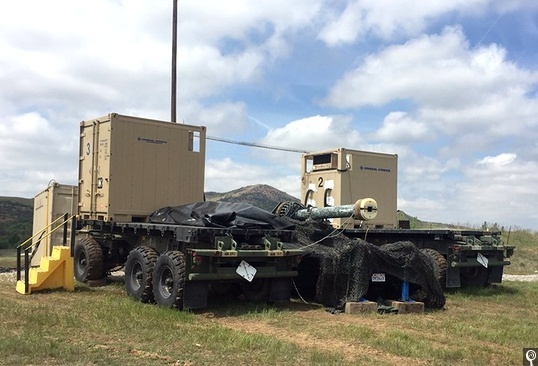 General Atomics Electromagnetic Systems (GA-EMS) officials demonstrated its Blitzer electromagnetic railgun system at the U.S. Army’s Fires Center of Excellence annual Maneuver and Fires Integration Experiment (MFIX)last month at Ft. Sill in Lawton, Oklahoma. There were eleven firings of the Blitzer railgun during the MFIX event, all at a target with a range that was greater than previous Blitzer firings. At the end of MFIX, GA-EMS’ Blitzer railgun system will be transported back to Dugway Proving Ground in Utah for more testing later this year. GA-EMS’ Acoustic Detection System, an unattended ground sensor system for multi-target simultaneous detection and tracking, was also showcased at the MFIX event. The system can monitor multiple sensors simultaneously and enable visual detection and tracking of acoustic and seismic sources. General Atomics Electromagnetic Systems (GA-EMS) tested their hypersonic projectiles with prototype components for their Guidance Electronics Unit (GEU) successfully performed programmed actions and communicated component performance to a ground station via a telemetry link in tests carried out in 2016. The GEU, housed in the aerodynamically stable test projectile consists of a number of components, including integrated navigation sensors and processors for guidance, navigation and control. The five test projectiles were fired at accelerations greater than 30,000 times that of gravity (over 30,000 gees) from GA-EMS’ 3 mega joule Blitzer® electromagnetic railgun system. The projectiles and the critical components within them experienced, survived and operated in the multi-Tesla magnetic field within the launcher and the overall launch environment. All of the GEU components performed as expected during and after the launch event, and through multiple seconds of aero-stable flight. Over the past year, GA-EMS has performed pioneering engineering, development and successful testing of electromagnetic railgun launched hypersonic projectiles and projectile components. “We continue to perform risk reduction and technology maturation of projectile designs and components to culminate in an integrated demonstration of a maneuvering railgun launched projectile”, Bucci continued. 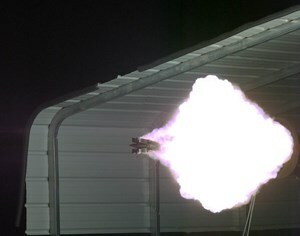 GA-EMS’ Blitzer railgun is a test asset designed and manufactured by GA-EMS to advance technology development toward multi-mission railgun weapon systems. Railguns launch projectiles using electromagnetic forces instead of chemical propellants and can deliver muzzle velocities greater than twice those of conventional guns. Blitzer railgun technology, when integrated into a weapon system that includes the launcher, high density capacitor driven pulsed power and weapon fire control system, can launch multi-mission projectiles with shorter time-to-target and greater effectiveness at longer range.